Strips of onion, pickled in vinegar, sugar, hot sauce and pickling spices, an excellent addition to sandwiches, burgers, beans and greens. I had several requests for the recipe I use for the pickled onions pictured with my turnip greens, so I promised to squeeze it in here over the weekend, between all the holiday posts for turkey and dressing and all those side dish goodies we're all looking forward to here in a few days. The British have their pickled pearl onions, often served as an appetizer at local pubs, but the South, well, we have our own version of pickled onions. You'll most often find ours served family-style at catfish houses, right alongside the all-you-can-eat fried catfish, turnip greens, coleslaw, fried okra, and cornbread. For pickling, I prefer the sweeter onions myself, though you can use regular yellow onions, white onions and some folks even like to pickle the purple onions. Those are a bit to strong for me, so for my taste it's sweet. Vidalia onion season is, of course, short-lived, and over until next spring, but you can find other sweet onions year round now. Shuman's sweets are pretty good and they are available year round from sources all over the world. Pickling onions only requires a very basic sugar and vinegar mixture, some salt and pepper, and you can keep them as simple as that. I also like to add a little garlic and a few basic pickling spices to mine for a little extra flavor. You could certainly omit the pickling spices and have a very good pickled onion. 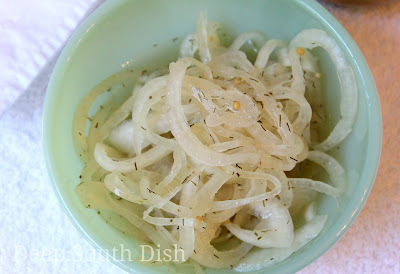 If you want a tangy dill version, like that pictured above, include the dill weed, but if you prefer a more heavily sweetened pickled onion, omit the dill and use a little more sugar. I also find the apple cider vinegar to be less tangy to my taste buds than plain white vinegar and a good flavor enhancement, so I almost always choose it over white, but use what you like the best. Pickled onions are great as a condiment over all sorts of southern field peas, purple hulls, crowders and all kinds of beans, including pintos and even baked beans. I sure love them with any kind of greens. They're also great on hot dogs, burgers and sandwiches, chopped up in potato or pasta salads, in coleslaw, or even in deviled eggs. Take a scoop of them, caramelize in a skillet with some butter, then add them to a fried bologna sandwich, slapped between two slices of Bunny bread with yellow mustard. Heaven. Halve onions and slice thin, about 1/4 inch thick. Place into a bowl and cover with ice water; let rest for 30 minutes. 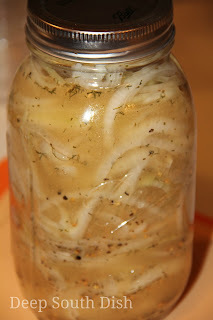 Drain and pack the onions into a clean quart sized Mason jar. Whisk the remaining ingredients together until sugar is completely dissolved. Top onions with the dressing and refrigerate a minimum of 24 hours, or up to 3 or 4 days if possible, before using, as the flavor only improves as they sit. Keep refrigerated for about 4 months. Use as an appetizer, on salads, sandwiches, hamburgers or hotdogs, bbq, serve over beans, greens or chop and add to a wide variety of recipes. Cook's Notes: If you prefer a sweeter pickle, eliminate the dill weed and increase sugar another 1/2 cup or more to taste. May also substitute red onion, however, be aware the taste is stronger than sweet onion and that the color will be more on the pink side. This recipe is not intended for canning, which requires a different process, but they will last several months when stored tightly covered in the refrigerator. Wow! I'll bet those are terrific! Aren't blogs just great for that Chris! Yummy! These are great. I know they will be a hit at my Thanksgiving table! I mixed the dressing right in the Mason jar and then packed in the onions. Also added red pepper flakes. Great recipe! I used a plain white onion and I'm waiting the 3 or 4 days to try them, but they sure smell GOOD. I sure hope you enjoy them - please let me know!! I do love the sweet onion better myself, though red, yellow & white all work fine and you don't even have to use the mustard seed - I just liked the flavor it adds for pickling. I made these today and they are delicious. I can't wait until they have some time to mature! I was confused about how many onions it would take to make 4 cups. It only took 1.5 because they are so large! So, I will be making this again with all my leftover onions. Only had access to Walla Walla Sweet onions but it still worked out well. Thanks for a great recipe. You're welcome Kathryn! How many onions you'll need will vary since the onions can vary widely in size. Sometimes Vidalia onions are huge and other times they are fairly small. I know those Walla Walla's were good!! Thank you for this awesome recipe! I've started making these by the quart and giving them to my extended family. They would go through a pint in a week or two! I've also canned them in a boiling water bath (I tried a few pints, figuring there was nothing to lose), and they turned out really well. Thank you so much for taking the time to come back and share your results! I know it's helpful to other readers but I especially appreciate you sharing that you and your family have enjoyed them. That really means a lot to me. Thanks so much!! Can you use mixed pickling spice instead of the listed spices? Have you used mixed pickling spices instead of individual spices listed? I have not, but I"m sure it would work!